True Detective season 2 has frequently been criticized for slower pacing, but this week’s episode, “Down Will Come” decides not to go so quietly into the night. The Cast Beyond Carcosa is here to talk about a couple of pivotal developments in the show before exploring the consequences of this week’s climatic shootout. The case picks up some steam when Ani and Ray decide to visit Elliot Bezzerides to find out how he might have known Caspere and his associate Irving Pitlor. It looks like Vinci’s crooked mayor has hidden ties to everyone involved, which is more than a little suspicious. Our main duo also decide to take a detour to the bit of spoiled land we saw in the opening moments of the show. The clues are slowly starting to come together, and we discuss all of of the new possibilities that are now on the table. Elsewhere, Frank continues to reassert his authority on Vinci’s underworld as he cracks new deals with mobsters and begins purchasing new clubs. His arc this season continues to play into the gangster archetype, and we’re not quite sure if we’re thrilled by where it’s going. 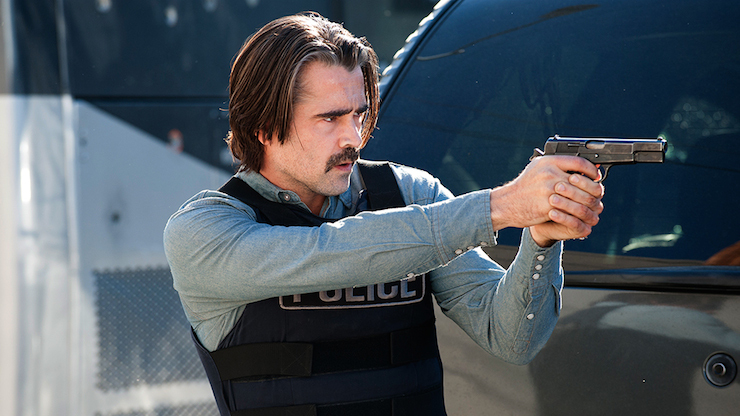 Finally, we end the midseason discussion by talking about True Detective‘s fine execution of the tightest firefight we’ve seen since Michael Mann’s Heat. It may have had us on the edge of our seats, but in the aftermath, we couldn’t help but feel like the entire conflict was the biggest red herring the show has thrown at us yet. “Down Will Come” was packed with thrills and intrigue, but how exactly does this match up against other episodes of the season so far? Tune in to hear our full length discussion on all of this and more.